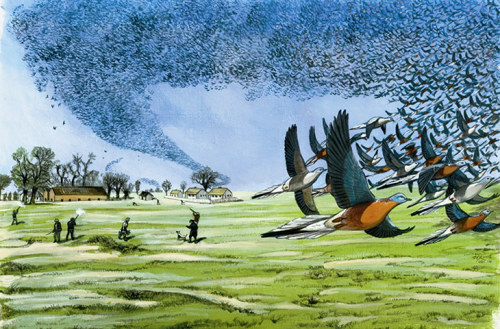 You've probably seen the news in the past couple weeks about some biologists talking seriously about "de-extincting" the Passenger Pigeon. The idea is to take DNA from museum specimens of the birds - nearly a century gone now - and inject them into Band-tailed Pigeon stem cells, eventually resulting in birds that are nearly pure Passengers. Despite the scientific salaciousness, though, many birders seem to think that this ain't the best of ideas. One of them is mega-birder, ABA blogger and owner of probably the best-researched birding blog on the innernet, Rick Wright, who posted on his Facebook page that this Passenger Pigeon hoopla was nothing more than "short-sighted gimmickry." One of these nay-saying birders is NOT, however, me, who loves the idea of our skies once again darkened with Passenger Pigeons - and any other long-dead feathered friends we can reconstitute. I got in touch with Rick and he kindly agreed to swap emails discussing the practical and moral implications of bringing back the birds. I had a blast, and I thank Rick for hashing it out with me. Find our exchanges below the jump. Werner Herzog is an absolute golden god of cinema. His fiction films are uncompromised and ballsy in a way that no other filmmaker's are. Of all the great things about these films, my favorite is that Herzog harnesses the seemingly long-lost joy of cinematic spectacle, eschewing computerized special effects for much more incredible, honest-to-goodness realism - whether it's the unending parade of South American trekkers at the beginning of Aguirre: The Wrath of God, the African coast signal flaggers in Cobra Verde, or the insane meta-joke that is the pulling of the steamboat in Fitzcarraldo. For birders, many of his documentaries (his more recent ones, especially) are special for a different reason - because they exhibit a deep interest - a loving interest, I think - in the perversities of the natural world. He films insane penguins running inland toward certain death in Antarctica in Encounters at the End of the World, and an insane man following Alaskan bears in Grizzly Man. Herzog imbues these documentaries with a sense of fascination that other "nature" documentaries don't. Which is why I was dismayed recently when I was watching his 2010 documentary Happy People. The film focuses on the lives of fur-trappers in the remote taiga of north-central Russia. It's a beautiful film, providing a glimpse into a lifestyle that I didn't think existed anywhere in the world. The Russian taiga looks a whole lot like a much bigger, wilder version of Maine, where I grew up, and so I relished in the sights and sounds of the deep woods. If you listen VERY carefully, you can hear both song types of a Black-throated Green Warbler (both the "zoo zee zoo-zoo zee" and the "zee zee zee zoo-zee" songs). What's the problem? Of course, that Black-throated Greens don't live in Russia. It's an after effect. Now I can't be sure that this was done with Herzog's OK. I'm a bit confused on how it all worked, but Happy People was actually filmed by a Russian named Dmitry Vasyukov and then re-edited in to its present form by Herzog. I am not sure when the sound effects were added, but added they were. I thought that of all the world's filmmakers, the last I'd be doing a Birds at Large piece on was Werner Herzog. His documentaries, I thought, were above these kinds of cheap, unthinking tricks. Alas. Special thanks to Derek Lovitch - the only birder I know who has been to Russia - for help with BTNW range questions. Labels: bird sounds, birds at large, werner herzog, what is this bird? It's always bothered me that most media outlets don't capitalize the common names of birds. I've just never understood why. It's unnecessarily confusing - does "I saw a yellow warbler" mean you saw the species Setophaga petechia or that you saw a warbler of the color yellow, like a Prothonotary or Pine Warbler? To cast that combination of words back among the unwashed lower-case, then, is to rob it of its magic. To a birder it seems undignified. To a scientist, though, treating species not as icons but as data (or, more likely, with a much better understanding of the muddy fluidity that is the "species" concept), or to a layperson, who couldn't give a crap either way, the common name is meaningless, unworthy of extra typeface. An English professor would explain that the difference is common vs. proper nouns. The argument is that, basically, the common name of a bird species is not capitalized because there are lots of individuals of that bird. So, while the words Eastern Bluebird refer to a unique species, they don't refer to a unique bird, and it should be just eastern bluebird. I think this is garbage. Say what you will about common nouns, but there's nothing common about Common Goldeneye: the uncommon combination of those words means the author wasn't referring to some common goldeneye but a Common Goldeneye, an uncommon bird among all birds but one distinct from - and more common than - the uncommon Barrow's Goldeneye. The "common-ness" of a common noun falls away when it refers to something specific. The academic distinction erodes further when talking about brand names. Under most style guides, Jeep Golden Eagles and Plymouth Road Runners get the royal treatment but golden eagles and greater roadrunners don't. Why is that? 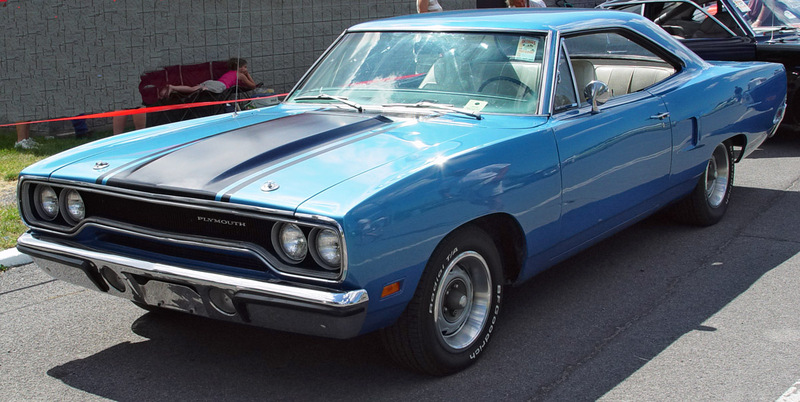 Like a bird's common name, saying "Plymouth Road Runner" doesn't refer to a single car but a group of alike cars that are somehow distinguishable from others. You're telling me that some stupid marketer's focus-grouped baloney gets capital letters but living creatures that have literally reshaped their own bodies over thousands of years to better survive harsh and changing environments are "common"? Look, just capitalize your common species names, OK? Show a little respect.